* The table must be able to hold at least 2000# in addition to its weight. I work on engines sometime and if this was a general purpose table as well, it would be nice. * The table must have surfaces for cutting with my torch and plasma. * The table must have a funnel to catch sparks from cutting and channel them into a removable cleaning pit. * The table must have the ability to add clamps and other jigs easily. * The table must be able to take the heat of torch, tig and SMAW without significant warping. Below is a picture of some initial design ideas I whipped up in my CAD program. I created the table with 1/3 as a cutting surface and 2/3 as a welding and clamping surface. The cutting area is a grid of 1/4 inch by 3 inch steel bars set on the side in slots cut in the side rails. The idea is when a slat gets damaged by cutting it can be replaced. What isnt shown in the drawing is the funnel underneath. It will be a 4 sided funnel made of 12ga sheet and leading down to a collection pot. 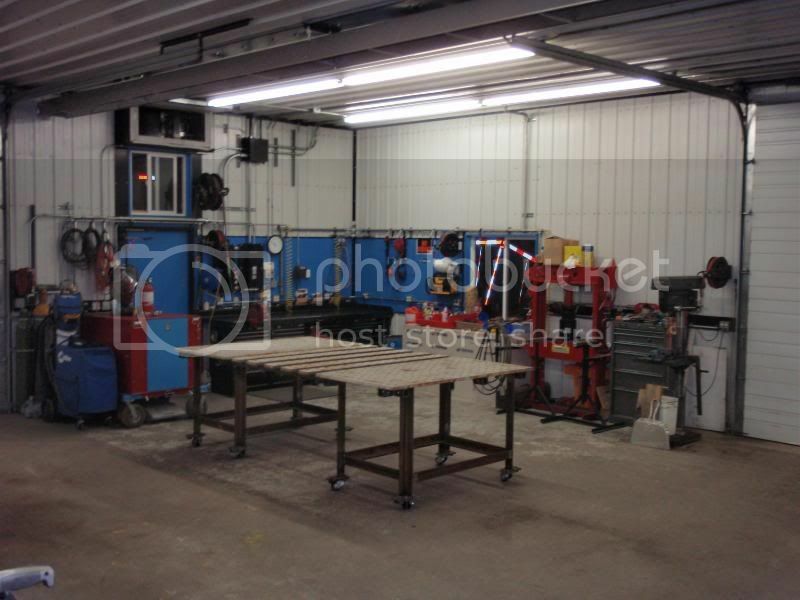 The welding area is composed of three 12 inch wide, 1/4 inch thick steel plate. Each plate is placed 2 inches from the previous to allow the insertion of bar clamps and so on. In addition, the plates are drilled through with 1/2 inch diameter holes every 3 inches so that stainless steel bolts can go through the surface to rig up clamps. I have thought of welding the surfaces to the frame but I think it would be better to fix them with stainless steel bolts so they can be replaced when needed. The top frame is .321 wall 4" by 1.721" C channel. I opted for C channel because it is provides a clamping surface as well as being less prone to corrosion than enclosed rectangular tube since air and moisture cant get trapped inside like a tube. The legs are currently designed as 4" x 5" x 1/4" rectangular tube though I might try to go C Channel here as well. I will have to brace them a bit more against racking other than the welds holding them. I havent put those braces in the drawing yet. The legs sit on heavy duty double locking casters from northern tool. The whole thing weighs, by my calculation of volume vs .35# per cubic inch of steel, 471# as currently designed which is making me wonder if I am getting too extreme in the engineering here. Perhaps I can use C channel with a shorter web (3" maybe) or thinner walls. The top surfaces do need ot be 1/4 at least for heat warping reasons since I use a torch a lot. However I am thinking the legs are perhaps too big and I could get by with C channel and a plate welded to the end of the channel to bolt the casters to. I am wondering If I need to brace the legs as well by welding cross members on them just above the casters. Probably wouldn't be a bad idea given that the table can roll. And the 1/4 inch plates are braced underneath with a single cross member in the middle. The problem with turning the C channels around is that it gives me limited surface to secure the legs to. Probably would be better to leave them as is and create an overhang (which I would have to do anyway if I turned them around. Last edited by kraythe; 01-30-2010, 12:22 AM. 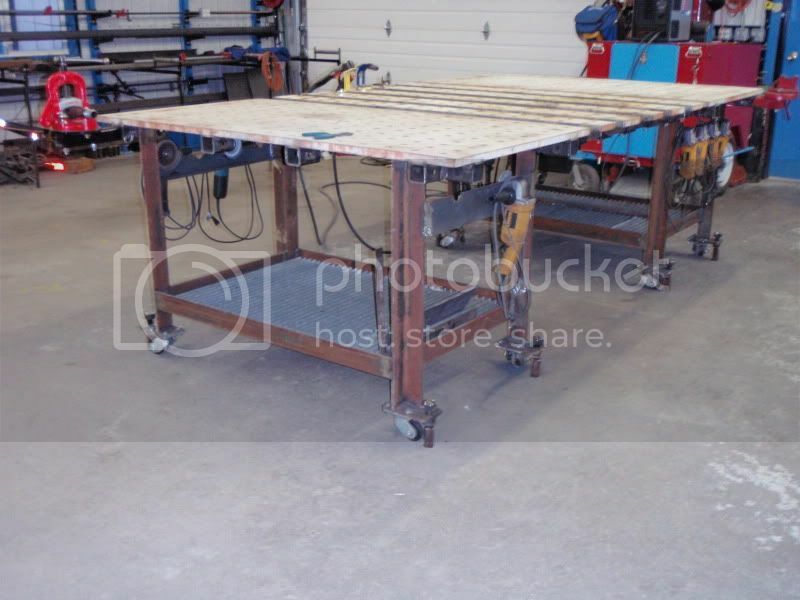 You guys building a welding table or a ram for car crusher? If enough force is being applied to steel pre weld to justify the beef ya'll are designing, you are gonna need a much larger surface area. Use square tube for legs, 3" or better,..frame top with angle or sq tube 2" to 4". Cope 6' channel on ends to drop in and be movable for the top. If more than this is needed, check your prep. 2000# is nothing to laugh at. Stripping a truck engine out and placing it on the table is a lot of stress. What you described would bend and probably fail. Just do a 2000# load on your 2" tube over 5 feet in a deflection calculator. Last edited by Pass-N-Gas; 01-30-2010, 10:22 AM. Wow that is a **** of a table. is that 2 inch thick steel top? You would need a forklift to move that. Thanks for the photo showing the holders for mig gun and plasma gun. I just printed that one so I can make similar ones for my welding table. Also I just noticed your 2 inch receivers under the table. My table is 1/2 inch plate, 4 foot square, with 3 inch angle iron legs. I was lucky enough to be given this gem which saw very little use. I have the two inch receivers on three sides of the table with a bunch of different fixtures that fit into them for quick change. When removed the table is clear and flat. I went a little further and made some smaller receivers for one inch square tube, using angle iron. With a little cleanup on the inside of the one inch tube, 3/4 inch square bar fits nicely inside of it. These smaller receivers I use for lights, bench grinder and vertical mount of portoband. Your C Channel will be useless for Clamping, you need a much larger over hang. 1/4" Top for 2000# work??? The table is 1 inch thick(like my sig says "a forklift to move the heavy stuff with"- the complete table weighs over 2,000 lbs), I had a "Really Good" day at the salvage yard the (3) sheets were pre drilled, the angle iron used in the legs is a 3x3x1/2, I only have about $650 in the table. the most expensive part was 20' of the 2 1/2 receiver tubing. I use that size as it is compatible with the receiver on trucks, that way any of my vises I use on the work bench or welding table can be used on the work truck as well. 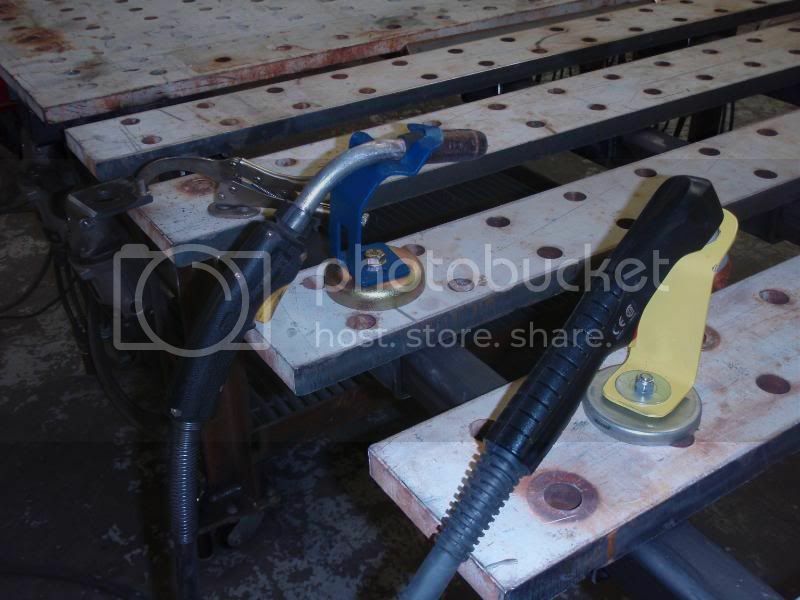 You can use drill press clamps in the pre-drilled holes or jig up as needed for about any project, the middle slats slide for adjustment as well, the tables can be separated if needed. 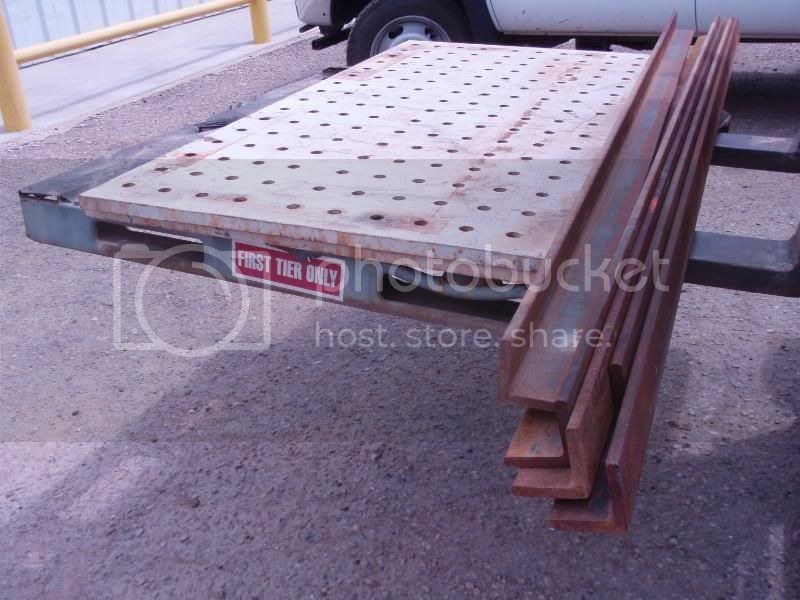 the floor-grating shelf allows you to stack metal on edge.. the shelf is high enough to roll a cherry picker under the table to pick up the projects with.. 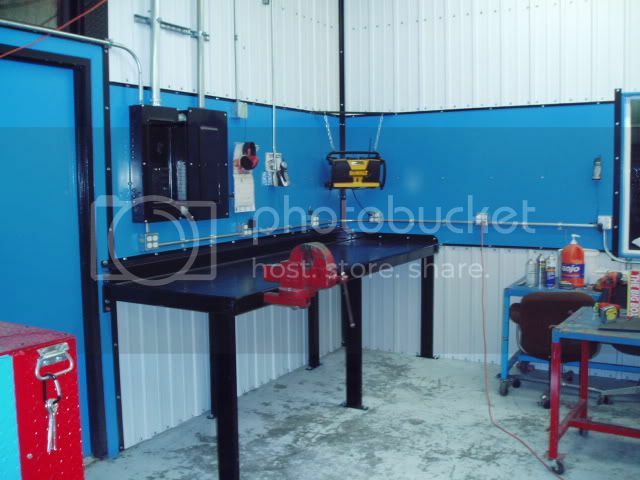 The Blue over the bench is 1/8 HR plate..that could be another line to the YMBAW if you use sheet metal instead of pegboard over the workbench..
Last edited by Pass-N-Gas; 02-02-2010, 12:18 PM. Great looking shop Steve!! I love that heavy table. I built 2 separate tables so that I can combine them if needed. I like the way you did your's better with the "slats" between them. kraythe, I used 3/8" plate on my tops. If I were building them again today I would not go under 1/2". Building a good table isn't cheap, but it's cheaper to do it right the first time rather than have to go back and do it over to make it right. I personally would NOT use 1/4" for a table larger than about 2' x 2', especially if you plan to use a heating torch on it. Leave 3 or 4 inches overhang to clamp to. (another reason for a thick top) Use GOOD casters and you will be able to move a heavy table by yourself. Yeah thanks. I think the size up to half an inch has to happen for sure. I think I will have to brace underneath the welding surfaces. I am debating ditching the c channel altogether and going with rectangular tubing as I can get more strength per weight. Of course the question then is which tubing. I calculated a 2000# load on a 2x5x1/4 tubing (standing tall) was about 1/20th of an inch if loaded at the center and that is probably acceptable. I am going back and forth about the cutting portion of the table. Part of me says just make a small inset in the end rather than a whole huge area. There is merit to that line of reasoning but I get concerned about running out of space while cutting which would be inconvenient. 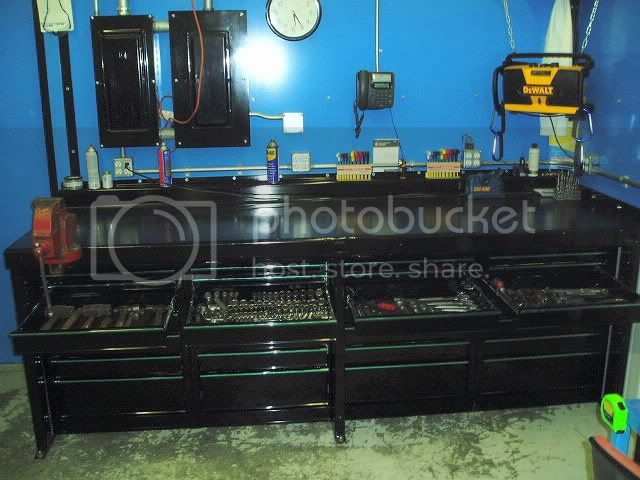 I do need a cutting area though as I love to use my torch and it would be much better to have a collector of sparks since this will be in my garage. You could keep the c-iron just allow the ends of the plate to hang over 3" or so ( the depth of your biggest clamp) You could make these out of some 1/2 or 3/4 x 6 plate, drill and tap the bottoms so they could be attached to the c-iron frame with an adjustable bracket. This would prevent them from coming off when you get western with the project.. by spacing your slats (see my center section) this would allow your clamps to be placed just about anywhere on the table.. This design would allow you to build your cutting end and spark chute under it,or you could even make it a wet table to minimize the smoke going into the house. To save time on the cutting section look at some floor grating material.. Like Jim-TX says good casters and leveling feet are a must as well..
Last edited by Pass-N-Gas; 02-02-2010, 04:21 PM.